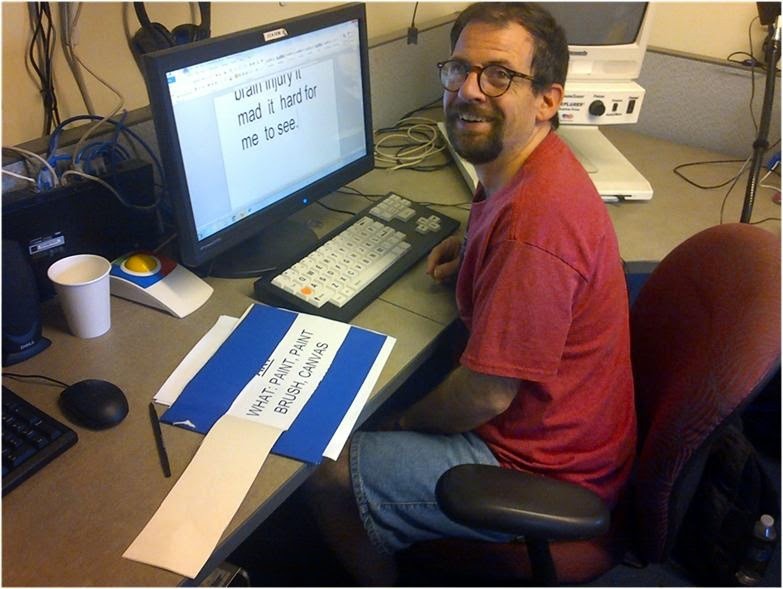 Today’s Technology Tuesday comes from Chris Baumgart, Imagine!’s Assistive Technology Specialist. Chris provides us the latest edition of a little segment he likes to call “Chris’s Corner.” Thanks, Chris! "That’s Chris in the Corner. 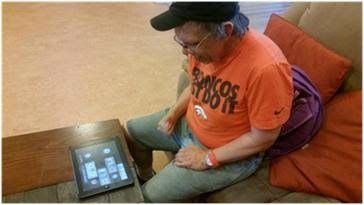 That’s Chris in the spotlight"
In this photo, Rae, one of the residents at the Bob and Judy Charles SmartHome in Boulder, is testing out a new prototype for an interactive journal that is modeled after the communication software Rae uses with her communication device. This interactive journal offers auditory prompts asking Rae a number of questions, including, “How are you feeling today?”, “What did you do today?”, “Who did you see today?,” and a number of other questions that give Rae an opportunity to practice some of her core communication skills. In addition, the journal gives Rae the opportunity to review her responses with others once she’s completed an entry, helping her to organize her thoughts at her own pace before communicating with others. It looks like there are still a couple ways we can optimize this journal before it’s ready to be released, so stay tuned for updates! Breadworks Bakery and Cafe in Boulder, located at 2644 Broadway, between North Street and Alpine Avenue, is currently displaying artwork created by members of Imagine!’s CORE/Labor Source art classes. The art will be up all weekend, and through Tuesday, September 30. Breadworks is open Monday - Friday 7 am - 7 pm and on Saturday and Sunday from 7 am - 6 pm. Then, throughout the month of October, Ozo Coffee Arapahoe, located at 5340 Arapahoe in Boulder, will be displaying CORE/Labor Source artists’ work. Ozo is open Monday – Saturday from 6 am – 6 pm, and on Sunday from 7 am – 4 pm. Please try to find the time to stop in and check out the artwork at Breadworks or Ozo (or both) and thank the store employees for displaying the art. Below are pictures of two of the talented artists, in front of their art, featured at the Breadworks show. Lana is pictured with two pieces of her art. One piece is of sunshine rays that Lana made by sewing string onto the canvas with a needle and thread. When asked how long it took her to create that piece, Lana said, “A loooooooooong time.” The other piece was made by Lana transferring paint to the canvas by dipping the bubble wrap into paint and pressing that onto the canvas, thus creating the composition of her colorful artwork. Linda is pictured with her art piece of an angel. She said that the angel is her brother, who passed away. Linda likes to honor people who have passed away through her art. Today’s Technology Tuesday comes from Suzanne Phillips, communication Teacher at Imagine!’s Longmont CORE/Labor Source hub. How is Longmont CORE/Labor Source taking technology OUT of the computer lab and into the classroom? Today I want to tell you about the technology utilized in our cooking classes. We have several students with mobility issues. Some of these students cannot move their hands and arms more than a few inches. How can we make a valuable life skill such as cooking accessible for these individuals? Plug the Able Net Power Link 4 into an outlet. Plug a switch into the Power Link. This switch now controls the “on/off” function for the electrical device. Turn the electrical device “on.” The device will now turn on only when the switch is pressed, and will turn off when the switch is released. This technology makes participation in cooking classes possible for students with an extremely limited range of motion. These students can choose how long they would like to activate a device, blending/processing ingredients to various consistencies. This technology gives teachers the opportunity to create a hands-on cooking experience for all students, regardless of mobility. Check out the short video if you would like to see the Power Link in action, and stay tuned for more technology in the classroom updates! This piece of good news came to me from Jessie Irvin. Jessie receives support services from Imagine! and is also a valued volunteer for our Dayspring department. Just a few weeks ago she got prosthetic legs, and offered to share her story. Thanks Jessie. Yes! On August 14, 2014, I got my prosthetic legs. I was born without femurs, but I walked from the time I was three until I was 21. When I was two years old, they were going to do prosthetics for me, but they would have had to cut my feet off, and one my parents wasn’t sold on that idea. So, I had it in the back of my mind all my life that someday I may get prosthetics. The reason the doctors wanted to perform the surgery when I was two is because I was so young I wouldn’t have remembered the surgery and I would not have the phantom limb situation, but I think that now that my feet have stopped growing they don’t have to remove them for the prosthetics. It was recently that I decided to get them. I was tired of being short and not being able to reach things, like getting my own glass of water. The first time I had the prosthetics on, Texas, my cat, jetted away. But the next time I had them on, he used them as a scratching post, so he sure got accustomed to them quickly. I asked my doctor if I could roller blade, and he said as long as I’d done it before I could do it again. I told the doctor I’d been roller blading for as long as I can recall. My provider nearly hit the floor when she heard that one. She had no clue that I had roller bladed, so it was pretty funny. I grew up roller blading so it was no big deal to me. Although now that I think about it, I’m not sure if I want to attempt it, because it’s farther to fall if I’m using the prosthetic legs. I do want to learn to ride a bike however. I will need prosthetics that can bend at the knee for that though. They want me to get used to getting my balance first. Recently, when I was wearing my new legs, I was at the Dollar tree and when I came in I knocked over a pile of baskets. I’m still getting accustomed to having longer legs. I’m still learning how to navigate with them. Trying to open the door is a challenge, I’m just not used to my legs being that long. I am able to get in and out of bed with them, and I’m starting to be able to stand better on them. I can take about four or five steps, but my biggest fear in having the prosthetics is falling. It’s normal, people fall, but I have to learn to get back up without hurting myself. My arms are getting stronger because I have to hold myself up. I can’t rely on my back yet, for strength. Getting on and off the couch is getting better. I’m learning how to use a walker to some degree. I use a walker as I’m not quite ready for crutches yet. I will keep you updated on my progress. It is nice being able to get my own glass of water! Today’s Technology Tuesday comes from Erika Schroeder, a Communications Teacher for Imagine!’s CORE/Labor Source department. As Erika notes, when we talk about using technology to increase self-reliance among the individuals we serve at Imagine!, we don’t always mean the absolute newest, latest, and most complex gadget or systems. 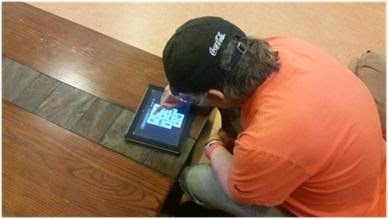 Sometimes, it just means knowing what adjustments can be made to current and easily accessible technologies to meet the needs of individuals with a variety of intellectual and developmental disabilities. Read more below. When thinking of modern technology the first things that come to mind are the newest phones, the smallest computers, and the quickest processing speeds. These advancements are impressive but sometimes we forget about the already available and adaptable technology that surrounds us. Many of the individuals we serve have challenges with their vision. Whether it’s being farsighted or nearsighted, adjustments must be made. In Microsoft Word, there is a drop down box in the “Font” toolbar with numbers in it. This allows the font to be adjusted to any size suitable for the user. One of our clients writes with a large font and then shrinks it down to a smaller font for printing in the Imagine!ws newsletter. At CORE/Labor Source’s technology lab, we also have access to keyboards with enlarged font and buttons. One keyboard has enlarged letters in the QWERTY format; another has enlarged letters in ABC order. Some individuals experience challenges with their motor skills. Adapting the mouse is the simplest solution. In our technology lab we have a mouse with a rollerball that works similar to a laptop mouse pad. Using one finger or the palm of your hand, you can roll the bright yellow ball in any direction to move the mouse on the screen. Click the start button on the left of the taskbar. Now the mouse will have reversed right and left click buttons. In our Creative Writing class, we use these simpler technologies on a regular basis. 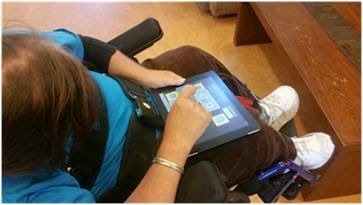 Adaptations such for challenges in vision and motor skills create opportunity for those who may have felt that using a computer was impossible before. Pictured below is Gabe in the CORE/Labor Source Writing Class, demonstrating simple technology adaptations including an enlarged font, a roller mouse, and an enlarged keyboard. If you missed it, check out this post I made earlier this year about the accomplishments of the participants in the 2013-2014 Leadership Development Program. Then, please join me in welcoming the 2014 – 2015 members of the Leadership Development Program (pictured below from left to right): Mason Turnage, who works for Imagine!’s CORE/Labor Source department; Sarah Baglee, who works for Imagine!’s Early Intervention department; Emily Pitt, who works for Imagine!’s Innovations department; Elena Ciaravino, who works for Imagine!’s Out & About department; Cassie Rogers, who works for Imagine!’s CORE/Labor Source department; and Meagan Rountree, who works for Imagine!’s Case Management department. Supported employment offers people who have a disability the opportunity to develop vital job skills and become active participants in their communities. The benefits extend far beyond helping individuals served by Imagine!, however. Businesses using our services are able to reduce recruitment and training expenses as they benefit from a diversified employee pool. Partnering with CORE/Labor Source is a “win-win” situation that is beneficial all around. We are very grateful to our business partners who have demonstrated their commitment to Imagine!’s mission by employing CORE/Labor Source participants. Today’s Labor Source 30 for 30 partner highlight: Ramble on Pearl. I thought I’d end this series about our business partners by highlighting one of our newest partners – one with a very similar mission to Imagine!. Ramble on Pearl is a brand new specialty shop offering premium manufacturers of recreational and active lifestyle clothing and accessories at least 30% below retail. While the store concept is a unique addition to Boulder’s retail landscape, what makes Ramble on Pearl truly revolutionary is their relationship with Boulder Treasures, Inc., their nonprofit corporate parent, founded in 2013. 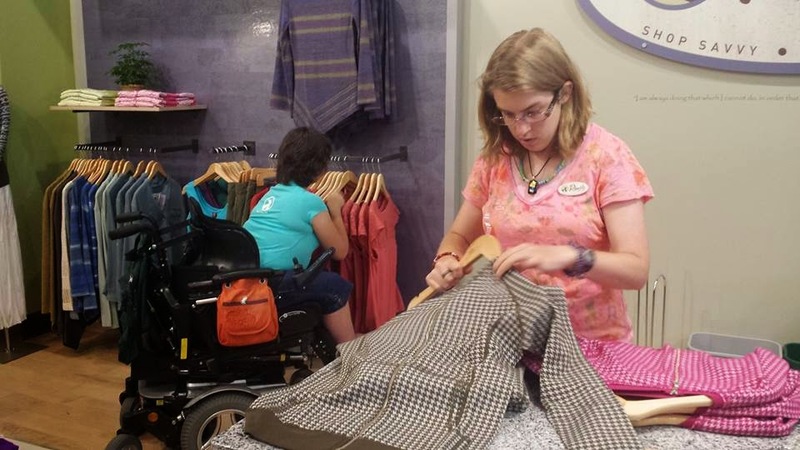 Boulder Treasures was established to create pathways to meaningful employment for adults with cognitive disabilities through on-the-job training, work experience, and job placement services provided within a retail store established, designed, and staffed specifically for that purpose. At Ramble on Pearl, apprentices will learn transferrable job skills by working alongside specially trained professional retail staff. Their goal is to become a trusted source of enthusiastic and reliable employees for the broader employment market. September 5 was day one for the first two apprentices at Ramble on Pearl (pictured below). They did so well! They're already sizing items on the floor, hanging clothing, folding tags, putting stickers on bags, and learning the layout of the store. Nice work apprentices! 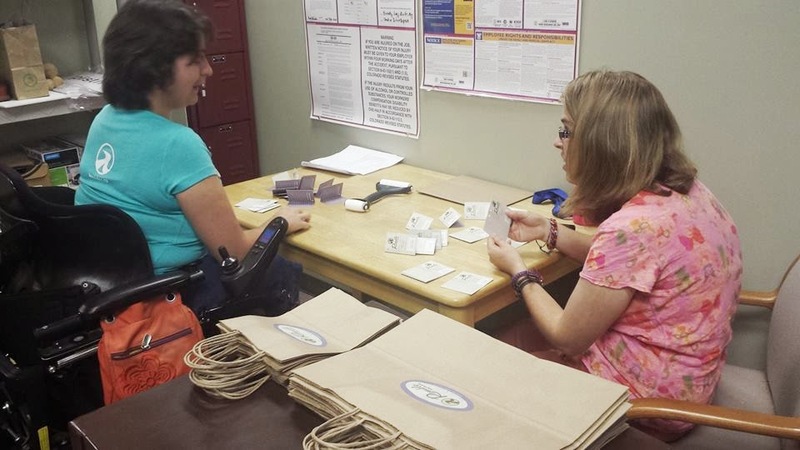 Thank you, Ramble on Pearl, for this unique approach to providing employment opportunities for individuals with intellectual and developmental disabilities. I look forward to many years of a successful collaboration. 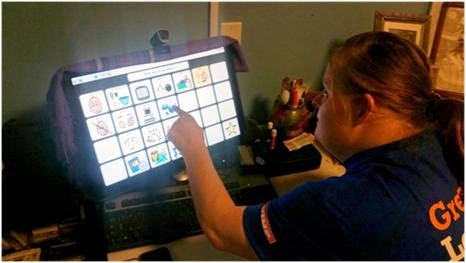 This week’s Technology Tuesday features another edition of “Stephanie’s High Five” – where Imagine!’s Assistive Technology Lab facilitator Stephanie Tilley shares five apps for tablets and mobile devices that may benefit individuals with a variety of intellectual and developmental disabilities. Stephanie is a Certified Therapeutic Recreation Specialist who has worked for Imagine! for more than 10 years, and is the author of “101 Adapted Games for Kids,” which provides adaptations for children’s activities to create inclusive activities and environments. Tally Tots is a collection of number activities that teach the basics of numbers and counting. There are interactive games including activities such as matching, sequencing, sorting, building, and puzzles for each number up to twenty. Examples of activities include placing marbles on a maze or feeding acorns to a squirrel. There is also a page of numbers from 1-100 that users can tap on and count the numbers as they are tapped in order up to 100. After each number has been tapped, the numbers can then be randomly tapped to be reviewed. Alpha Tots is a touch interactive game that features puzzles and activities that help build the foundations needed to learn how to read. Every letter of the alphabet is featured with a different task that has to be completed for each letter. For example, for the letter B users build a Robot, and for the letter D users dig in the sand. The tasks need to be completed in order for each letter before users move on to the next letter. This app features a friendly bird named Homer. Each user (up to 4 users with paid membership, 1 user with the free version) is set up by adding his/her name and picture. The user then goes to the hat shop and picks a thinking cap before starting the activity. There are 50+ skills offered in this activity including: letter sound recognition, proper pronunciation or letter sounds, upper and lower case letters, middle and ending sounds in words, blending, spelling, site words, vocabulary, fluency, and comprehension. Activities include Story Time, Discover the World, Learn to Read, and Homer’s Clubhouse. Users have the option of creating their own story or having a story created for them. When creating a story, users choose a hero, a place, what happens first, next, and how the story ends. There are six options from which to choose for each section. Once the story has been created the user can read the story independently or have the story read to them. Once the story is complete, users can rewrite stories over and over again mixing and matching characters, locations, and what happens during the story. This app features a dancing Grandma as she has fun adventures in her garden. There are eight mini games: 1 – Match the Vegetables, 2 – Color the Vegetable, 3 – Count the Vegetables, 4 – First letter, 5 – Shapes, 6 – Touch the colors, 7 – Spot the Difference, & 8 – Number Groups. Each game features a different skill and the games rotate from one to another to keep users engaged. I have several good news items I’d like to share today. To start with, I’m happy to announce that Imagine! is the featured non-profit this month on KUNC radio (91.5 FM on the Front Range and 102.7 FM in Boulder). If you haven’t had a chance to hear the radio piece they are running about Imagine! (several times daily) click on this link to give it a listen. Thanks KUNC for the opportunity! Secondly, I’d like to give a big shout out to Imagine! employees Lisa Bargatze and Caitlin Looney. Over the weekend, the pair took the time to update the accessible parking signs in Imagine! parking lots to feature a new, active image. At Imagine!, we think visual representation matters. People with disabilities have a long history of being spoken for, of being rendered passive in decisions about their lives. The old icon, while a milestone in ADA history, displays that passivity: its arms and legs are drawn like mechanical parts, its posture is unnaturally erect, and its entire look is one that makes the chair, not the person, important and visible. As people with disabilities of all kinds—not just chair users—create greater rights and opportunities for social, political, and cultural participation, we think we should evolve our images of accessibility too. Describing the new image with words such as active, abled, engaged, ready-for-action, determined, and motivated helps provoke discussion on how we view disabilities and people with disabilities in our culture. The symbol does not “represent” people with disabilities, but symbolizes the idea that all people with disabilities can be active and engaged in their lived environment. The active accessibility symbol helps re-imagine how society and individuals view people with disabilities. To learn more about the nationwide Accessible Icon Project, the motivation behind Lisa and Caitlin’s efforts, click here. Finally, and most important, I’d like to remind everyone that next week, Sept. 7-13, has been designated Direct Support Professional (DSP) Recognition Week as part of the American Network of Community Options and Resources’ (ANCOR) National Advocacy Campaign. Spearheaded by ANCOR members, with partners including the National Association of Direct Support Professionals (NADSP) and the National Association of State Directors of Developmental Disabilities Services (NASDDDS), National Direct Support Professional Recognition Week is celebrated annually across the country to honor the tens of thousands of workers who enable people with intellectual, developmental and other significant disabilities and their families to live healthy, community-oriented lives. 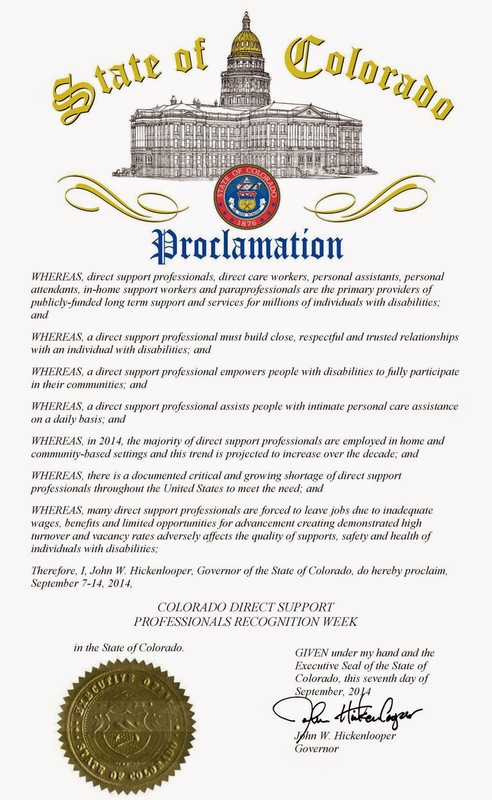 Locally, Colorado Governor John Hickenlooper issued a proclamation recognizing DSP Week and honoring these vital workers. You can check that out below (click on the image to see a bigger version). At Imagine!, DSPs are the heart and soul of our organization. Imagine! is so fortunate to have so many dedicated, talented, and passionate people who are willing not only to take on this difficult job, but to excel at it. I see first-hand every day the impact a Direct Support Professional can have on an individual with a cognitive or developmental disability. So to all of Imagine!’s DSPs, I’d like to offer hearty “thank you.” Words can’t convey how much you mean to our organization and the people we serve. I am honored to call you my co-workers. Today’s Labor Source 30 for 30 partner highlight: Colorado Division of Vocational Rehabilitation (DVR). Colorado offers a strong, diverse workforce many employers may not even know about. These men and women have a range of skills and abilities, and they could really help businesses grow - if the businesses only knew where to find them. DVR is committed to helping their employer partners find candidates who are skilled, loyal, and committed to your success. Even after placement, employers and employees get ongoing support from DVR's professional staff, including job training, guidance on the ADA regulations, and information on disability and employment guidelines. DVR can also help with financial incentives and facilitation of tax credits. Across Colorado, too many workers with proven skills are currently left out of the workplace. As Colorado's leading placement organization for people with disabilities, DVR is working to change this by bridging talent and ability so companies and employees succeed. CORE/Labor Source and DVR share the same goal: to get individuals with disabilities employed in their communities. We are delighted to work side-by-side with them. 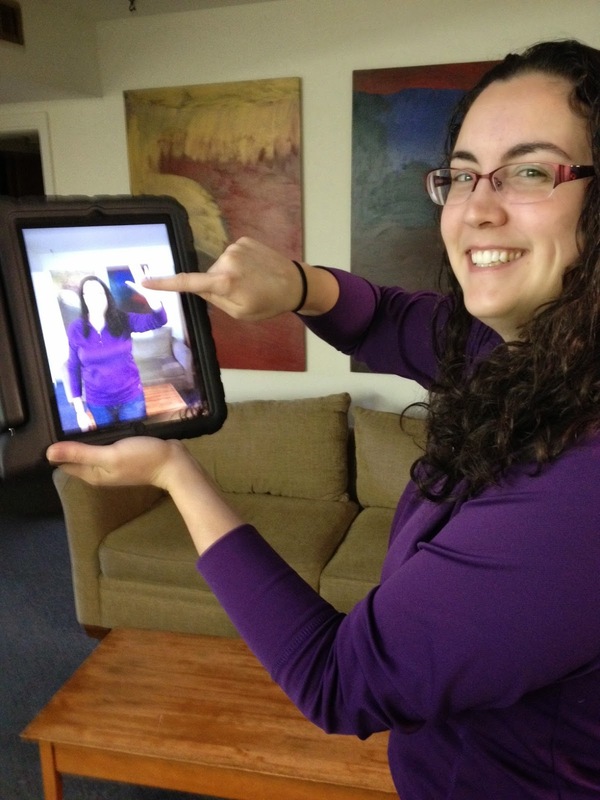 I’m sharing a new feature on my blog this week – Technology Tuesday. As I hope my blog readers already know, Imagine! has spent the last decade (and more) exploring how technology can be used to provide opportunities for the individuals we serve to become more self reliant and have greater engagement in their communities. We have a lot show for these efforts, so this weekly blog entry is designed to share what we are doing, what is working (and what isn’t), and to promote more conversation and idea sharing around these important initiatives. Technology Tuesday isn’t new to Imagine! – we’ve been sharing these on our SmartHomes blog for more than a year. So feel free to check out previous posts on that blog, but look for new ones on my blog weekly moving forward. Back in July, we posted an update on the collaboration project between Imagine! and the University of California Santa Cruz. In this update, we were excited to let you know that we would begin testing at the end of summer. As it turns out (and no, we can’t believe it either), the end of summer seems to be already approaching quickly. Students are back in session, the leaves will be turning soon, and it’s time to start up some iPad testing. We have now begun testing apps that review skills of number recognition, money recognition, color recognition, and the newest additions, shape recognition and the skill of money addition. Check out these pictures below of John and Donna, who live in Imagine! 's Bob and Judy Charles SmartHome in Boulder, helping us to take the new apps for a test drive. And as always, stay tuned for more updates!